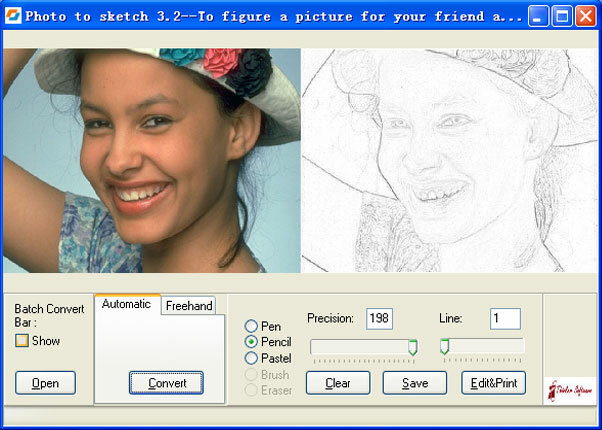 Convert a photo to excellent sketch,only one click! v3.5 can add texture effect To figure a sketch for your friend !Send a characteristic sketch to them as a fun gift, and give your friends a pleasantly surprised! Sketch Master - You can make pictures with Frame. can convert photo to sketch. can input photo from PC Camera,and show real sketch effect. Make album with your photos. Registered user can free get Photo to Sketch v3.5 and get 165 frames. Sketch Studio - Sketch Studio is an easy to use drawing program for children. Although there are a number of drawing programs available for children, Sketch Studio is unique in that it contains built-in drawing lessons. PostworkShop - Transform your photo, 2D image or 3D render into an oil painting or old-time photograph. Get more than 300 different results with a single click! Create a personal line that makes you recognizable or surprise your friends with new styles every day! Digital Physiognomy - Face reading rules in practice. An entertaining psychological profiling software application that determines person's character and traits based on facial features. MockupScreens - Sketch screen mockups and experiment interactively with your clients. Organize mockups in scenarios and quickly create wireframe of your application, before any coding has started. MockupScreens main design goals are ease of use and productivity. BatchPhoto - BatchPhoto is a powerful photo manipulation program that makes it easy to touch-up, annotate, transform, apply effects, and rename hundreds of photos in a single operation. Try it free! gPage - gPage is a powerful but easy to use drawing program. Create Web images, digital photo presentations, CD labels and jackets, technical diagrams, logos, pamphlets and more ! Print or export your work to file in JPG, PNG, GIF or WMF format. PhotoBling - With PhotoBling, you can apply various special and artistic effects to medium sized JPEG images (under 1 megapixel). It's easy to use. Just open an image and apply one or more one-click presets!